Find your Power Type to discover your personalized plan for weight loss, energy, and lasting health. No more one-size-fits-all diets! Modern womanhood often means juggling multiple roles—businesswoman, mother, spouse, homemaker, and more—all while being expected to look perfectly composed. In other words, it means being superhuman. The truth is, it can seem impossible to maintain physical health while navigating our busy lives. We’re overwhelmed and exhausted, which can often translate into unhealthy eating habits, lack of exercise, and no time for self-care. But diet and fitness plans are usually one-size-fits-all, and those universal programs just don’t work for every body and every personality. Integrative health and wellness expert Tasneem Bhatia, MD, known to her patients as Dr. Taz, has a plan that is anything but cookie-cutter. Her mission is to help women achieve optimum health, and now she can help you with her personalized plans in Super Woman Rx. 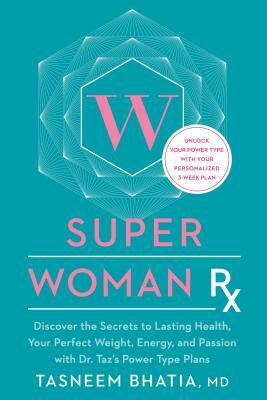 In Super Woman Rx, Dr. Taz sets out to treat “super woman syndrome” by offering five prescriptive plans based on a woman’s unique blueprint, or Power Type, whether you’re a Boss Lady, a Savvy Chick, an Earth Mama, a Gypsy Girl, or a Nightingale. A fun quiz will help you narrow down your type and figure out which strategies will work best for you. Drawing inspiration from Ayurvedic, Chinese, and Western systems of medicine, each nutrition and exercise plan helps you shed pounds, decrease anxiety and depression, rejuvenate skin, reduce PMS symptoms, and much more in just 3 weeks. Then, long-term strategies with specialized plans follow those 3 weeks. With Dr. Taz’s comprehensive, personalized guidance, you’ll radiate from the inside out. TASNEEM BHATIA, M.D., is a board-certified physician specializing in integrative and emergency medicine, pediatrics and prevention, with expertise in women’s health, weight loss, and nutrition. She is the author of What Doctors Eat and The 21-Day Belly Fix and the host of RadioMD’s The Dr. Taz Show: The Super Woman's Whole Health Fix podcast and of the popular YouTube series, Kitchen Cures. She has served as the medical expert for CNN Headline News, a Dr. Oz Sharecare expert, and has been featured in such media outlets as The Dr. Oz Show, TODAY, Access Hollywood, Good Morning America, EXTRA!, Live with Kelly, and The Doctors. She is a contributing editor to Prevention magazine and an Assistant Professor at Emory University. She lives in Atlanta, GA, with her husband and two young children. "...A perfectly traditional self-help guide, which works on the premise that while everyone is a lovely individual snowflake, we all fall into certain emotional and physical categories, and if we figure out our category we can determine the best diet and fitness and psychic-energy plan to empower ourselves."